← If It Feels Good Tomorrow . . . Chances are high that most CEO’s don’t have much time to read, either for business or pleasure. And chances are even higher most don’t read books about corporate culture. Articles and books on leadership or M&A lessons, maybe, but books and articles on Corporate Culture is for the HR executive, not the CEO. Wrong! The captain can’t control the wind, but he can control the tiller and the condition of his ship! These, and other external forces are constantly bombarding your organization and often interfering with your company’s business objectives. A price war starts and your planned profit margins go out the window. A shift in customer preferences and your next fall line-up is in danger of becoming obsolete before it is even released. A new competitor from Asia has come up with a significant product improvement. Most businesses are at the mercy of shifts and changes in their markets and environments. We don’t control these shifts, but we must react. However, there is one important force for business performance that is totally under the control of the CEO and the executive team: Corporate Culture. And it has now been substantiated in many different studies over the past decade that culture impacts business performance! Yet, the sad fact is, most CEO’s and senior executives don’t have a clue what their culture is, and worse yet, whether their culture is a barrier or enabler to business performance! Do you know why most culture change programs fail? Do you know why Culture Statements and Value Statements do more harm than good? Do you know how corporate culture is built? Did you know about one of the most successful business culture changes that didn’t start out as a culture change effort? Who in the organization has the most influence on whether a culture is functional or toxic? (most people guess wrong). Why do great cultures drift towards the dysfunctional? What is the most effective culture change methodology? Why most culture surveys and assessments don’t really measure culture! Do you fully understand the impact of the senior team on corporate culture? 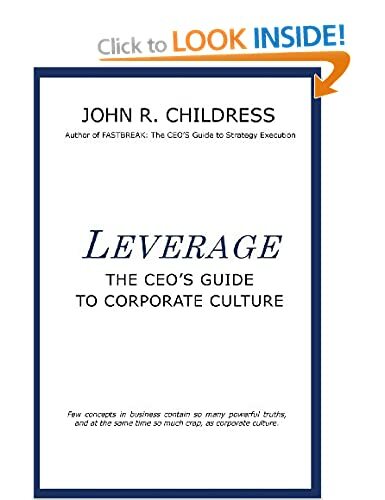 LEVERAGE: The CEO’s Guide to Corporate Culture is now available in paperback at Amazon, Barnes & Nobles, Baker & Taylor and Blackwell. 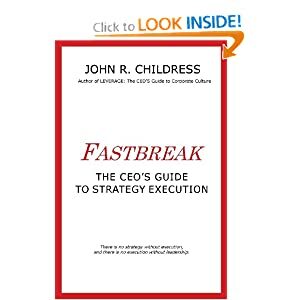 This entry was posted in corporate culture, John R Childress, leadership, Organization Behavior, strategy execution and tagged business performance, Corporate Culture, culture change, John F Kennedy, leadership, Leverage, mission statements, values. Bookmark the permalink.